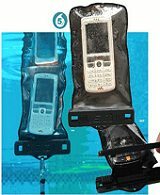 Waterproof Cases from EZ Riser Bass Boat and Jet Ski accessories. This camera case from OverBoard will protect your camera from water, sand, snow, and dirt. Perfect for your thin compact digital camera. And best of all, you can still use the camera while it is in the case. You can even take pictures underwater with a regular digital camera or even your phone! The OverBoard Camera Case is submersible to 19 feet deep! 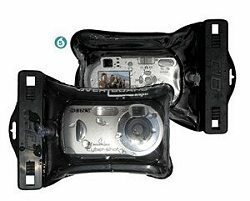 This unique camera case has an inflatable perimeter on each side -- providing both shock resistance protection and added bouyancy. A feature you will only find on OverBoard cases. Constructed from .42mm soft matte PVC, this waterproof camera case features a optically clear front and back side, and seals tight by way of OverBoard's patented Slide Seal System™. And each unit ships complete with a break-away safety neck lanyard. Supplied with neck lanyard and one desiccant sachet. Fits digital cameras without a telescopic zoom lens. Want to make a call when you're soaking wet? No problem: this case will protect your phone without stopping you from using it. Constructed from .42mm soft matte PVC. 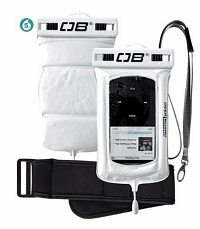 Features a transparent front and seals tight with OverBoard's patented Slide Seal System™. Phone is fully usable once sealed in the case. A Great fit for the NEW iPhone 3G! A must have for all watersports enthusiasts who never like to be without their favorite tunes. The padded sides and back improve impact resistance and buoyancy, adding the extra security of drop protection on land or water. 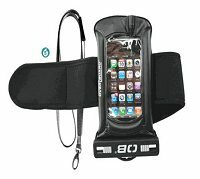 Supplied with a tough neoprene fully adjustable sports arm strap, these cases really are a market first! Pro-Sport MP3 Case is specially designed to protect your iPod, but will also fit many similar sized, and smaller MP3 players. Constructed from .42mm soft matte PVC. Features a transparent front and seals tight with OverBoard's Slide Seal System™. Products fully usable when sealed in the case. Please note: we do not recommend wearing these cases on your arm for lap swimming, because the repetitive motion of your arm bends the little wire back and forth so much there will eventually be a failure inside the wire itself. Fits iPhone 3G, iPod Touch, Classic, original iPod(all 2nd, 3rd, and 4th Generation), iPod Video, iPod Nano (1st, 2nd, & 3rd Gen), iPod shuttle (1st & 2nd Gen), and any other MP3 player under 4.25 inches in length and 6 inches in circumference. Recommended for use with the OverBoard 100% waterproof headphones, but fits any standard 3.5mm headphone jack plug. Desiccant 5-Pack: The air-tight seal of a waterproof case will trap the air's natural humidity inside the case. This can cause the creation of condensation droplets inside the case. It is highly recommended that a dehumidifying agent, such as these desiccant packets, be used when any electronic items are kept inside the waterproof and air-tight case. Desiccant is a high-absorption dehumidifying agent. Made with natural ingredients, each packet is environment-friendly, as they are re-usable and completely degradable. They can be dried with a quick trip through the micro-wave, and re-used multiple times. Warranty is supplied by the producer of the product EZ Riser Products resells these products and if there is a DEFECT the product will be shipped backed to EZ Riser and then Forwarded to the appropriate supplier for repair or replacement.